The National Park Sumava evaluate the project telemetry deer wildlife in the National Park Šumava. The authors Pavel Šustr summarized the results into an interesting book called Deer in the Bohemian Forest. The National Park and Protected Landscape Area Šumava still evaluates the results of the telemetry monitoring cervids game in Šumava. 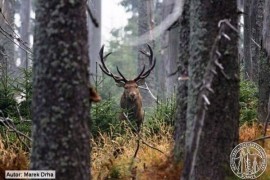 "Extensive and multi-year project that in Šumava lasted from 2005 to 2011, engaged in the study of movement, activity and behavior of deer living in the Šumava National Park , "explains Pavel Šustr, who is the former head of telemetry Management Team NP and PLA. Research deer in Šumava brought a number of attractions and new scientific findings that are also relevant at the European level. Wildlife National Park Šumava for such scientific research directly determined. "Space for large animals, especially mammals, is waning in Europe. Šumava together with the neighboring Bavarian Forest is one of the last areas in Central Europe which still leave room for large animals that can survive here, to find enough space for food entitlements and other activities where their numbers are sufficient to further maintain the population, " Šustr Paul wrote in the introduction to the new book. Year-round monitoring, where the animals of the neck attached special collars allow researchers Administration of NP and PLA gain detailed information about the life of deer throughout the year. An interesting feature is definitely the fact that deer from German and Czech side of the border have the old habits of their parents. "Deer on the Czech side of the Bohemian Forest goes exactly in places where previously there were wires that were before the state border. It is the same with German, "says Pavel Šustr., In practice, this means that German deer walks in the pasture to our inland you travel to Germany but will never come. Wires indicating Because of our state border were far ahead of her. Each monitored and each doe deer at time telemetry monitoring its name. The author then in each chapter follows the behavior of individual animals who were given their names - such as deer Richard, Isabel, Lojza or does homeland. Interesting victory scored deer Radek, who at the time of estrus, doe came for the longest time. It is the distance between the Sentinel and spruce forests. The behavior of animals can be traced following attractions: "If we look, for example, the knowledge related to deer, we find that the red deer in Šumava territory needs an average of 60 km2 and year the same area repeatedly used in consecutive years," says Pavel Šustr the fact that the population of deer and hinds are divided into seasonal migrants and sedentary individuals. Roe needs to live in Šumava significantly smaller than the deer, the order unit km2. But sometimes taking long-distance movements in search of new territories, the longest recorded movement pursued deer had over 60 kilometers. "Influence of deer on the recovering forest in Šumava (current state) minimum - in winter are the most preferred area covered by snow in summer predominant dietary herbal ingredients. Due to the fact that their population is naturally controlled deer predators - lynx - the low numbers, the impact of deer on forest is not great, "says Pavel Šustr. Interesting research findings brought about the Bohemian European elk population. Due to its complete disappearance of Trebon's population is still the Šumava last remnants of this kind in the Czech Republic. "Losa is so necessary to protect up despite occasional damage to the forest," explains Pavel Šustr. Regarding invasive species Bohemian deer deer - fallow deer, sika deer - it does not yet Šustr by the Šumava greater threat. "Increase the number of sika deer may cause future problems with deer crossing Europe," warns Šustr. Text of the book Deer in the Šumava complement spectacular photos administrative staff NP and PLA Mark Drha and Vaclav Hřebka. Important information value are also maps showing the movement of the animals in the Šumava forests.